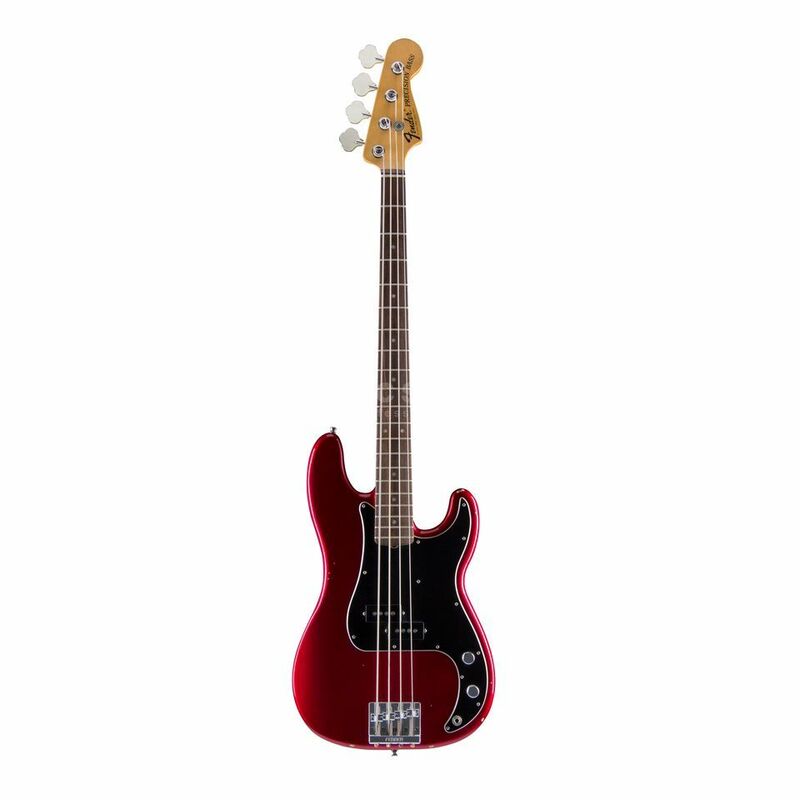 The Fender Nate Mendel Precision Bass is a replica of the original ’71 Precision Bass played by the Foo Fighter’s bassist since the beginning of the ‘90s. Every tiny detail was meticulously recreated, including the Nitrocellulose Candy Apple Red finish with a Gold undercoat. The finish is also lightly aged, reproducing the usage of Nate’s ’71 P-Bass. As requested by Nate, the body was not made from Alder but from Black Ash, giving this bass significantly more growl than the ’71 original. The profile of bolt-on maple neck is exactly the same as Nate’s original Precision and gives this instrument comfortable playability. The pickup selection of the Fender Nate Mendel Precision Bass includes a Seymour Duncan Bassline SPB-3 Quarter Pound. This pickup produces considerably higher output compared to other split-coils and delivers a fat, assertive sound with a fully developed middle spectrum. Also included as a special treat is a spare neck plate engraved with a special hybrid Foo Fighters/Fender logo as well as a deluxe gig bag. In conclusion, this bass impresses with an incredible price to performance ratio, which catapulted it to the top of our bass charts in very little time. I bought this bass from musicstore last month and it is fantastic.beautiful paint and perfect neck.